Hilux toughness doesn’t compromise on hi-tech features. On the sleek device panel featuring the new 7” touchscreen audio* system, this touchscreen is DVD* compatible, allows easy access to great features like Bluetooth*, fuel consumption information and audio. 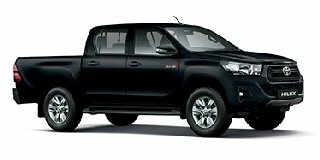 The Hilux also features 4.2”Thin Film Transistor (TFT) Multi-Information Display*, split into four divisions, it provides easy access to info such as outside temperature, kilometres travelled and how much longer you can go before you need to fill up. These options can be accessed through a switch on the steering wheel.